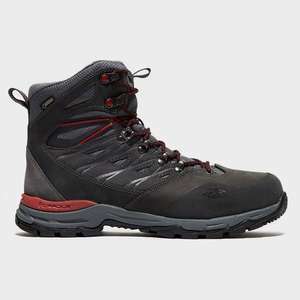 Take on any terrain inlcuding wet and rocky and remain sturdy with every step in The North Face Men's Hedgehog Trek GORE-TEX® Boots. A fully waterproof exterior and cushioned EVA midsole combines protection and comfort for the ultimate boot. Fully waterproof - GORE-TEX® waterproof membrane provides a reliable weather protection and has a high level of breathability. Extra toe protection - Smartlite® PU toe protects from stubs and rocky trails. Vibram® rubber sole unit - enjoy reliable grip and a stable stride on varied terrain. Cushioned underfoot - Two-piece, compression moulded EVA midsole combined with a Northotic™ Pro premium EVA footbed with gel heels provides a soft cushioning to shield you from the impact of every step. Some sizes (mostly smaller) are still 69 on Amazon. Showing std delivery as 3.99 for me.